There are as many variations of the salad as there are recipes, but there are only a few essentials. First, naturally, is crab – although you can add or substitute shrimp or you can use ersatz Krab. Second is lettuce, but your choices include iceberg, Bibb, red leaf, and Romaine among others. Finally, there is the sauce which is a close kin to Thousand Islands dressing usually, though not necessarily, without the pickle relish and with chili sauce instead of ketchup. Most, but not all recipes include hardboiled eggs, and asparagus spears are among the most common additions. Beyond that, everything seems to be fair game, including fresh fruit as described in the Commander’s Palace cookbook. Over time, many renditions of Crab Louie have begun to resemble a Cobb salad or salade Niçoise. Perhaps that’s part of the reason that the salad has lost its appeal. That’s too bad, because it is delicious and easy to make. Here’s one version in which the most challenging step is to make the home-made mayonnaise. Of course, you can just use bottled mayonnaise, and that makes it even easier, but the hand-made stuff improves the taste with only a few minutes of extra effort. 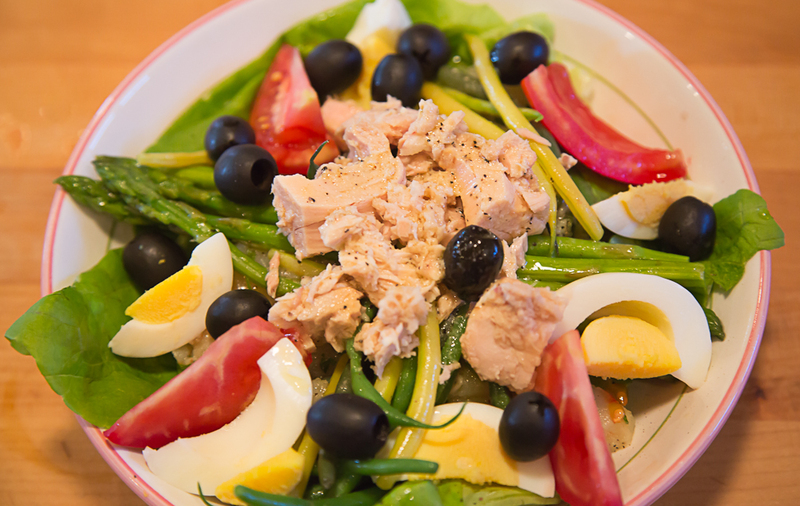 My image of the finished salad shows some sliced hard-boiled eggs with a faint green ring of shame. That’s usually the result of boiling the eggs too hard and/or too long, but it can also occur when the boiled eggs have sat in the refrigerator for seveal days. That’s what happened to the ones in the image. When they were freshly cooked, the yolks were perfectly golden yellow and silky. Sorry about that, but the goof has inspired me to write later about hard boiling eggs. Post to follow. In a medium bowl and using a wire whisk, beat the eggs until well mixed. Add the mustard and continue to whisk until well-combined. Add the oil very slowly, a few drops at a time, while whisking continuously. Make sure each addition of oil is incorporated before adding more oil. Addition of oil should take several minutes. After all of the oil has been added, continue to whisk for a minute or two before adding the lemon juice. Whisk until the juice has been completely incorporated and the sauce is smooth and glistening. Combine all of the ingredients in a medium bowl, correcting the seasoning with salt and pepper. Use immediately or refrigerate for up to 2 days. Arrange several whole Romaine leaves in a serving bowl. Top with coarsely chopped Romaine. Arrange chilled asparagus on the chopped lettuce. Arrange the cooked crab on the asparagus, top with sauce to your preference, and arrange sliced hard-boiled eggs around the edge. Our household is back to normal. My wife has returned, and that justifies celebration. More reasons to celebrate include her upcoming birthday and Mothers’ Day even though she told me many years ago in a somewhat icy tone, “I am not your mother.” Hence we both rely on telephone calls from our children to commemorate that event. A quiet home-cooked dinner seemed like a good first event in the protracted celebration cycle. No casseroles. No health foods. Small filets with some fresh asparagus seemed like a good choice. Somehow, though, a grilled filet seemed a bit plain. That’s when I thought of the classic sauce for filet, marchand de vin – wine merchant sauce. The first time I had marchand de vin was in Louisiana many years ago. A colleague and good friend hosted us. He was anxious to introduce us as newcomers to Louisiana cuisine. He had lived in New Orleans for many years and thought that the quintessential Louisiana company dish was filet marchand de vin. It was certainly delicious. From the name, you know the sauce has to contain wine. Beyond that, there are countless recipes with countless ingredients. Most French recipes call for the addition of demi-glace and/or other classic sauces. Their allium of choice is shallot, and for richness they often include marrow. New Orleans does everything with bold flavor, so the shallot became onion along with a lot of garlic. The recipe from Commander’s Palace substitutes ham for the marrow. This version represents a tweaking of the recipe found in Roy F. Guste, Jr.’s The 100 Greatest Dishes of Louisiana Cookery. Guste is a member of the family that owns the famous Antoine’s in the French Quarter. At one time he was the CEO of the restaurant, so he knows a thing or two about traditional New Orleans cooking. As you will see from the following recipe, there is a lot of garlic and wine, but the final brew definitely dresses up a plain old filet. I wound up using a shallot even though I knew it would be overpowered by the garlic. The reason for my transgression was that I had a shallot that needed to be used. You should use an onion if you like. We served the filets with fresh asparagus topped with hollandaise. Even though that’s a lot of sauces, it turned out to be a tasty combination. There were coconut cakes from a local artisanal bakery for dessert. A comfortable bottle of Badia a Coltibuono Chianti classico completed the feast. In a small saucepan, combine the butter and flour over medium-low heat, stirring until smooth and lightly browned. Add the onion and mushrooms, stirring occasionally until the onions and mushrooms are lightly browned. Add the tomato, garlic, celery, parsley, bay leaf, thyme, wine, and stock. Simmer for an hour until the sauce is thickened enough to coat a wooden spoon. If the sauce doesn’t thicken to your satisfaction, you can help it along by stirring in a few sprinkles of Wondra flour. Adjust the seasoning with salt and pepper You may keep warm until ready to serve or, if you plan to use it later, chill in the refrigerator and reheat when ready to serve. Cook the filets by your favorite method and to your desired doneness. Rest for 5 minutes and then transfer to individual plates. Top with the warm sauce and serve. We just returned from a visit with family in Texas, Susan’s sister and her husband. My sister-in-law has quit cooking because of some health problems, and my brother-in-law doesn’t like or know how to cook. For a while they have been living on frozen dinners and things you can make with a can opener. During our visit, I was assigned the responsibility of preparing meals. I chose to make old family favorites and some new comfort foods. A new dish for them was spaghetti all’Amatriciana from a cookbook by one of my blogging friends, La Tavola Italiana by Dianne Darrow and her husband, Tom Maresca. The meal was a big hit. Other favorites included shepherd’s pie and sautéed ham, Southern style. The vegetable dish that scored was asparagus sautéed with sugar snap peas. 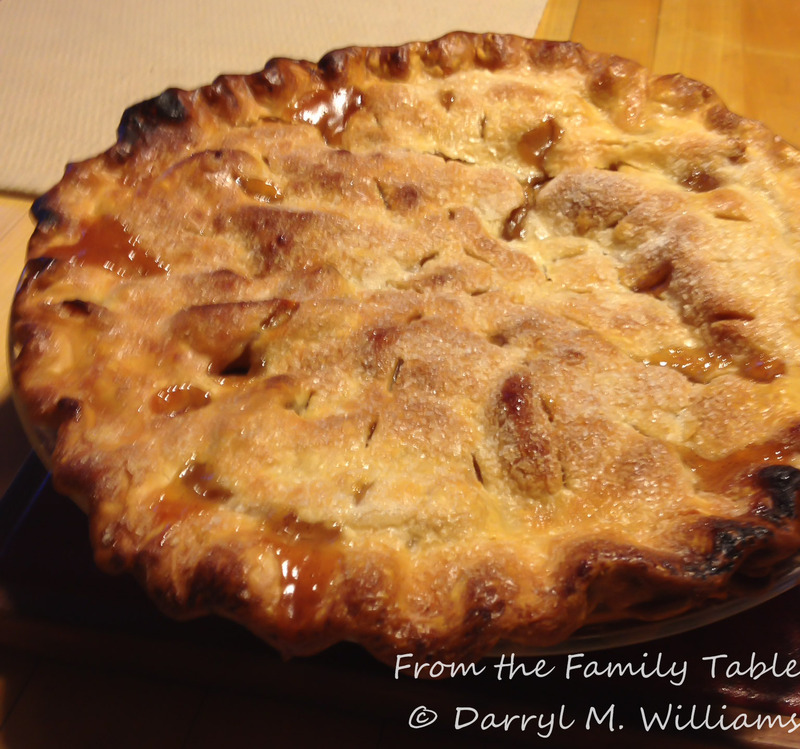 The best dessert was an apple pie whipped up by Susan, the family pie baker. There is not much to sautéed asparagus and snap peas, but since both vegetables are in season – or almost so – throughout the USA, the dish might make a good addition to your springtime repertoire. Stir in the sugar snap peas and continue to sauté until the peas are softened, about 5 minutes. A little bit of char is nice. Adjust seasoning with salt and pepper, and then transfer the vegetables to a serving dish. Sprinkle with grated Parmesan and serve immediately. I celebrated my 77th birthday the other day. For some reason it seemed momentous even though it wasn’t one of those that we all remember – 21st, 30th, 40th, and 65th. I guess by this time, I’m just glad to be celebrating yet another. Susan came up with some nice gifts: cooking classes the next time we get to the Bay Area and pickles from our local Barrio Brinery (I wonder if she was trying to tell me something about my disposition?) All of the children gave me a telephone call, so it was a complete and special day. But after a big breakfast at one of our favorite French bistros, Clafoutis, an outing in town, and shopping for the fixings, including duck fat, for a birthday dinner, we didn’t feel like eating. We – I – finally got around to cooking the other night and had a great menu of roasted pork tenderloin, oven-roasted potatoes, asparagus, and Hollandaise sauce. It was all fairly easy, and it wound up being tasty. It is getting harder and harder to find a traditional bone-in pork roast or a boneless pork roast. Most commonly one finds pre-packaged pork tenderloins. They have several advantages: they cook quickly and they are very tender. The main disadvantage is that they have little or no fat, so if you want to make pork gravy, you have to add some extra fat. I chose to use duck fat, which you can often buy frozen in a little bucket at a well supplied butcher shop, but you can use your favorite. Combine the remaining diced celery, carrot, onion, and minced garlic as a mirepoix. Set aside. Place the tenderloin on the roasting pan in the middle of the oven pre-heated to 425°F. Roast for 15 minutes. Remove from the oven and add the mirepoix and enough chicken stock to fill the bottom of the roasting pan to about ½ inches. At this point you may also wish to baste the tenderloin with more duck fat. Lower the temperature of the oven to 350°F and return the roasting pan to the oven for about 40 minutes. Put the potatoes (see below) in the oven at the same time. . When the tenderloin is roasted (145°F with an instant-read thermometer), remove from the oven. Transfer to a cutting board. Cover with aluminum foil, and let rest while you complete the rest of the meal. The temperature will continue to rise a few degrees while the meat rests. Remove the vegetables from the roasting pan with a slotted spoon. Deglaze the pan over a medium flame with the white wine. Combine the corn starch with about 2 cups of chicken stock and add to the pan, stirring constantly until you bring it to the boil and the sauce begins to thicken. Correct the seasoning with salt and pepper. Remove from the heat and keep warm until ready to serve. You can use any oil or fat that you prefer to roast the potatoes. A flavorless cooking oil with high smoke point, like canola would work , as would clarified butter. But duck fat gives a very nice flavor. Heat about 3 tablespoons of duck fat in a cast iron frying pan just large enough to hold the potatoes. Add the potatoes. Season with salt and pepper. Pour more duck fat over the potatoes, and place in the oven with the pork roast for the last 40 minutes of cooking. During roasting, shake the pan from time to time to keep the potatoes coated with fat. After about 40 minutes, test the potatoes for doneness with a kitchen fork. When they are cooked, remove from the oven and from the cast iron pan. Keep warm until ready to serve. Probably everyone has a recipe for fool-proof, quick Hollandaise made in a blender. There are a couple of pointers that get left out of most recipes. First, the butter is very important. It should be unsalted rather than salted, and you should take your time in clarifying it. Most recipes just tell you to melt the butter and skim off the foam and pour off the liquid at the bottom. Remember that the foam is actually milk solids and the liquid at the bottom is water (fat is lighter than water, so water and stuff dissolved in the water sink to the bottom). If you heat the melted butter over a very low heat for an hour or so, the foamy milk solids will become firmer and more granular so that it is easy to skim them off, in contrast to the foam that has not yet become denatured.. Second, the sauce will be thicker if you make the emulsion with egg yolks and clarified butter and then add the lemon juice, rather than adding the lemon juice at the beginning. In the meantime, place the egg yolks, salt to taste, and cayenne in the bowl of a blender. Blend. Then, with the blender still running, gradually pour in the warm – not hot – clarified butter, being careful not to pour in the water at the bottom. Add the butter through the smaller stopper in the lid rather without the lid, as the butter will splatter. Blend in the lemon juice. Adjust the seasoning if you wish. Slice the pork roast in half-inch slices. Arrange on the serving plates and top with a tablespoon or so of the gravy. Add the potatoes to the plate. Place asparagus spears on the plate. Nap with Hollandaise, and serve immediately. I’m still learning to use my new Lytro light field camera. It has several features that make it absolutely unique. Most importantly you can focus any part of the image while it is still in the viewfinder, and unbelievably you can focus again once you upload the image to your computer (As long as you have the provided software installed). You can make images of something very close to the lens and something in the background. Then you decide which you want to emphasize or bring everything into focus. The camera is especially useful for ultra-close-ups. I decided to play around with the camera for images of a dish to go with the shrimp, mushroom and artichoke mac and cheese from my most recent post. Actually, I had some fresh asparagus in the fridge and some puff pastry I needed to use up. I added a little pesto from the freezer, and I wound up with something easy and a little different. The way I did things, I was only able to make three servings, but very easily – and undoubtedly better – you can make six servings by just cutting more of the stem off of the asparagus spears. The crowns are the better parts anyway. When basil is in season and plentiful. you can make fresh pesto, but we often make extra and store it in the freezer for later use. It is also readily available in jars or frozen so that you don’t need to take the somewhat laborious extra step of making fresh pesto. Divide the rolled dough into three strips along the fold lines. 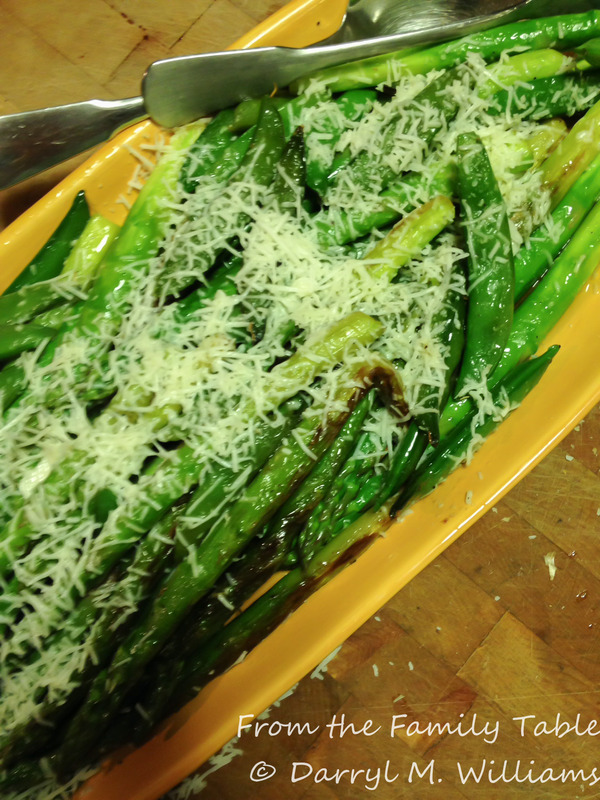 Spread a generous tablespoon of pesto over each of the asparagus bundles. Sprinkle the toasted pine nuts on top of the pesto. Paint the edges of the dough strips with some of the egg and water mixture. Fold the dough over the asparagus and pesto. With your fingers, seal the edges of the envelope. Then finish sealing, using the tines of a dinner fork and gentle pressure. Bake in the middle of an oven preheated to 400°F for 15 minutes or until the bundles are golden brown. Serve while still warm. A little Hollandaise couldn’t hurt if you like. A well-made spoonbread is haute cuisine cooking with corn. There are lots of recipes for spoonbread, but many of them are not much more than a version of cornbread. The version I love is more like a cornmeal soufflé, and baking one requires many of the methods and techniques used to make a soufflé. According to Bernard Clayton in his classic, The Complete Book of Breads, spoonbread was developed by accident in colonial Virginia when a batch of cornbread was forgotten. To me, that seems likely to be apocryphal because spoonbread – at least this recipe – uses entirely different techniques from cornbread. When we were dating, my wife, Susan, often made spoonbread at my request. She had many special dishes that proved she was a great cook, but without a doubt, spoonbread was one of her major achievements. After our children became old enough to have favorite foods, spoonbread was one of them, so much so that Susan sometimes made two separate spoonbreads for one meal. During our most recent visit to East Texas, Susan made spoonbread for her brother, sister, and brother-in-law. I flew in for a late dinner, and all I got was a dab. That was better than nothing, though, and many a late diner has missed out on Susan’s spoonbread. Some recipes call for added cheese. This version gilds the lily with added ham, mushroom duxelles, and scallions. The cheese can be added by serving the spoonbread with Mornay sauce. You don’t have to add all of those things. The basic model is good enough to keep you coming back for more. For this post, I combined the dressed up spoonbread with fresh asparagus and braised lamb shanks – both go well with Mornay sauce. In a 4-quart saucepan, combine the cornmeal and milk. Bring to the boil, reduce to a simmer and cook for 15 minutes until the cornmeal is soft. Remove the cooked cornmeal from the heat. Then stir in the salt, baking powder, melted butter and additional milk. Beat the egg yolks until foamy. Stir into the cornmeal mixture. Mix well to reduce lumps – you won’t be able to get rid of all of them. Stir in the chopped ham, mushrooms, and scallions. Beat the separated egg whites to form stiff peaks. By thirds, fold the egg whites into the cornmeal mixture. Do not beat. Pour the batter into a greased two-quart soufflé dish and bake for 1 hour in the middle of an oven preheated to 325°F (163°C). Serve immediately while the spoonbread is still puffed. Stir in the flour and cook for several minutes to remove the raw flour taste. Add the half and half, salt, pepper, and nutmeg and stir over medium heat until the mixture thickens. Remove from the heat. Stir in the cheese until it is completely melted. Stir in the lemon zest and juice and adjust seasonings. Keep warm until ready to serve with the spoonbread.